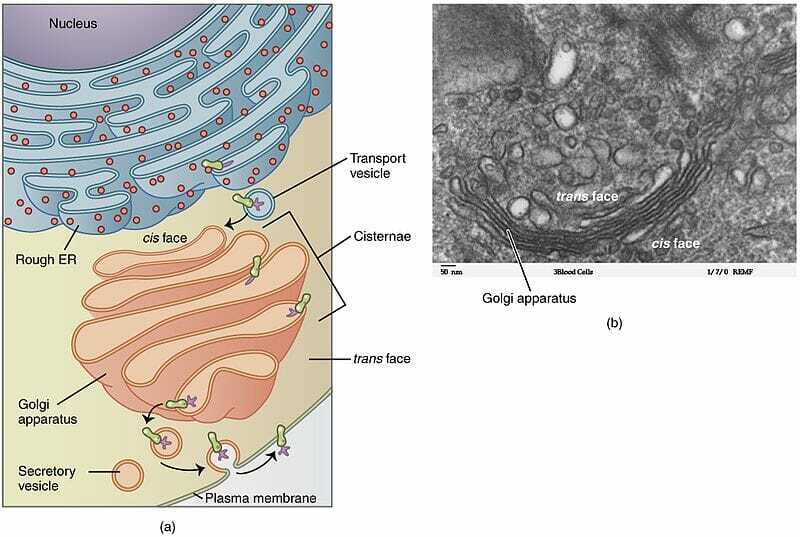 Vesicles are compartments formed by a lipid bilayer separating its contents from the cytoplasm or a fluid-based extracellular environment. They can contain either liquids or gases and have a wide range of functions in cells across the living world from regulating buoyancy to secreting hormones. The word ‘vesicle’ derives from the Latin word vesicula meaning ‘small bladder’ and can also refer to blisters in the body or gas bubbles in volcanic rocks. Nearly all plant cells and many protists and fungi have a central fluid-filled compartment called the vacuole. It contains ions, sugars, amino acids, some proteins, enzymes, and waste products. The membrane enclosing the vacuole is called the tonoplast and the term is an indicator of its role in maintaining turgor pressure inside the cell. Turgor pressure is crucial for the plant to remain upright. The tonoplast can regulate the concentration of ions in the cytoplasm and thus alter its pH. A low pH inside the vacuole helps in activating enzymes that degrade biological materials. The vacuole also plays a role in sequestering waste material and protecting the rest of the cell from harm. The size and number of vacuoles can vary depending on the needs of the cell. Animal vacuoles are usually a part of the larger movements within the cell, such as exocytosis or endocytosis. Contractile vacuoles are organelles that undergo periodic growth and contraction in order to regulate the water and ion content of a cell, especially in unicellular organisms that do not have a cell wall. Most cells have a greater ion concentration than the extracellular region, particularly in freshwater environments. In such conditions, water can enter through small pores in the cell membrane and eventually cause the cell to burst from excess water pressure. A contractile vacuole protects against this eventuality by using proton pumps on its membrane to draw water into itself during the growth or diastole phase. Periodically, the vacuole contracts and expels the water into the extracellular region again. Though the exact membrane composition, or even contractile mechanism of these vacuoles is not known, it has been observed as a pulsing organelle in many species, especially protists like amoeba and paramecium. Synaptic vesicles are found at the terminal end of axons in nerve cells (neurons) and contain neurotransmitters – small molecules involved in the transmission of electrochemical signals from one cell to another. These structures fuse with the plasma membrane of the neuron in response to a rapid change in electric membrane potential. This releases neurotransmitters into the synaptic cleft, the narrow region separating two neurons. Neurotransmitters then bind to and activate receptors in the next or post-synaptic neuron, generating an action potential that is then transmitted along the length of that neuron. Synaptic vesicles are small, about 40 nm in diameter and contain two types of proteins on their membranes. The first are proton pumps that allow selective uptake of neurotransmitters. The other group is involved in the transport of vesicles to the membrane and recycling of neurotransmitters. Vesicles can be classified based on a variety of factors, from function to location and the nature of their cargo. Based on their function, they can be grouped as those involved in transport, digestion, protection, secretion or osmoregulation. They can also be classified as intracellular or extracellular vesicles depending on where they are found. Finally, while most of them contain liquids, some microorganisms also use gas vesicles to optimize photosynthesis and regulate buoyancy. Gas vesicles are structures are seen in Archea and many aquatic species and possibly allow the microbe to rise up or sink in the water column to find optimal conditions for survival and photosynthesis. The gas vesicle also enables the cell to position the photosynthetic pigments close to the surface of the cell, near the membrane. These structures are unusual because they are formed purely by a protein-based membrane that has no lipid component. However, these proteins are extremely hydrophobic and can therefore create a barrier between the contents of the cytoplasm and the sequestered gases. Also known as exosomes, these structures are found in the extracellular fluid of nearly all eukaryotes. They are involved in intercellular signaling and contain large biopolymers and occasionally even genetic material. In fact, they are used in the signaling pathways across the living world, from bacteria using exosomes to transfer genetic material to mammals using it for antigen presentation and immune cell maturation. They play a role in cell growth and development as well as in controlled cell death, also known as apoptosis. Exosomes are also crucial for the expulsion of cytoplasmic waste products and the removal of plasma membrane proteins. Lysosomes are small structures seen in animal cells that are filled with digestive enzymes. They can fuse with other membranous structures and the combined vesicle can act as a digestive organelle. Lysosomes can fuse with food vacuoles in single-celled organisms such as amoeba, or endocytic vesicles containing pathogens that are taken up by cells of the immune system. The lysosome contains an impressive arsenal of enzymes, all of which act as hydrolases – they catalyze the breakdown of macromolecules through the addition of water. These enzymes work at a lower pH than the cytoplasm and can hydrolyze nucleic acids, proteins, carbohydrates and lipids, all of which are polymers formed by a dehydration reaction. Interestingly, the lysosome itself is protected from its own powerful enzymes because most of its membrane proteins are heavily glycosylated, with the addition of several sugar molecules. In the event of an accidental rupture of the lysosome, the neutral pH of the cytoplasm slows down the action of these enzymes and protects the cell from lasting damage. 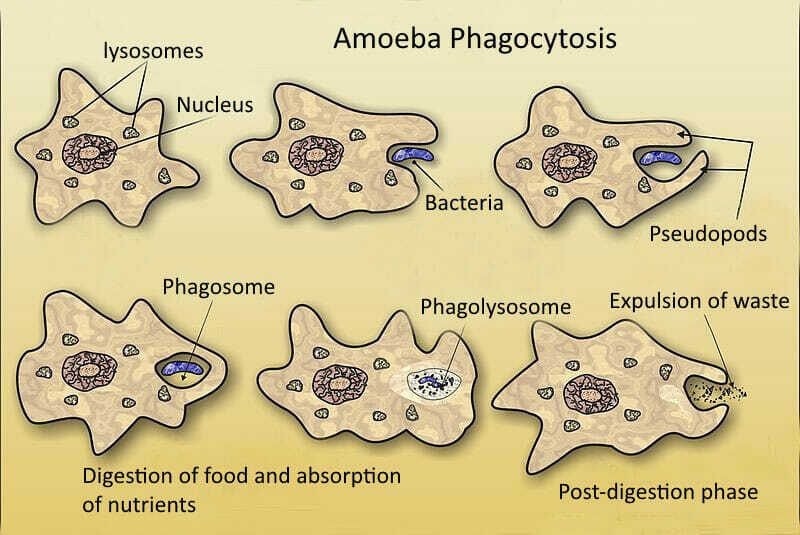 The image shows a bacteria being engulfed by an amoeba, which then digests it and uses the amino acids and simple carbohydrates to fuel its activities. Waste material is expelled by exocytosis when the vesicle fuses with the cell membrane. In this image, phagocytosis by an immune cell is shown. Initially, the pathogen is recognized and engulfed to form a structure called phagosome. The lysosome fuses with the phagosome, and the enzymes in the lysosome digest the microbe. Macrophages are dedicated phagocytes of the immune system that can engulf and digest everything from cellular debris and small pathogens to large cancer cells with abnormal antigens on their surface. Vesicles are also involved in the bulk transport of materials from one part of the cell to another. For instance, proteins synthesized in the rough endoplasmic reticulum are selectively sent into vesicles that become a part of the extensive Golgi network. Once inside the Golgi network, these proteins are modified and dispatched to their destinations based on signals in their amino acid sequence. Some hydrolytic enzymes are trafficked to the lysosome while other vesicles fuse with the plasma membrane and deliver membrane proteins. These transport vesicles are also important in transporting hydrophobic lipid particles through the aqueous cytoplasm. Another class of vesicles is created in the Golgi network and these are vesicles carrying cargo that needs to be secreted. They can be proteins and carbohydrates that are necessary for formation of the extracellular matrix or enzymes, co-factors, hormones and peptides that work outside the cell and are transported by the blood or lymph. For instance, secretory vesicles from fibroblast cells release glycoproteins, collagens and other fibrous materials to make up the extracellular matrix. Cells in the bone secrete minerals and matrix proteins, while cartilage cells (chondrocytes) are involved in the secretion of glycosaminoglycans and proteoglycans. These secretions continue constitutively, without the need for any external signals. 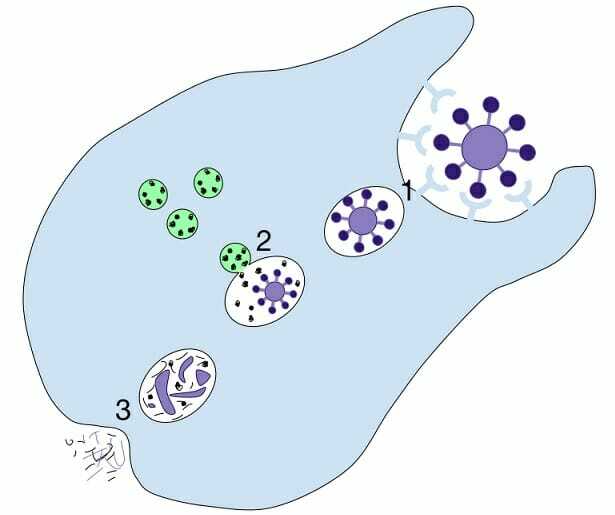 Synaptic vesicles, however, are examples of vesicles that fuse with the plasma membrane in response to the signal of an action potential. Other examples are cells that release hormones, enzymes or mucus. As seen from the various types of vesicles, they can be involved in buoyancy and optimizing photosynthesis (gas vesicles), intercellular signaling and material exchange (exosomes), intracellular digestion (lysosomes), transport and secretion (vesicles arising from the Golgi network). The can carry every type of cargo, from large apoptotic blebs and pathogens to biopolymers as well as waste material. They are necessary for the formation and maintenance of the plasma membrane, the extracellular matrix and internal cytoplasmic structure. Vesicles are also crucial for the functioning of cells involved in extracellular digestion, such as those lining digestive organs like the salivary glands. Finally, an organism maintains homeostasis by coordinating the actions of different organs through its nervous and endocrine systems. Both these organ systems need proper functioning of the vesicular network in order to accomplish their tasks. Apoptosis – Controlled, programmed cell death that is a normal part of an organism’s growth and maturation. Antigen presentation – Process by which cells of the immune system capture antigens and present them to T-cells, allowing the body to distinguish between pathogens and its own cells. Endocytosis – Bulk uptake of material by a cell through invagination of the plasma membrane. Exocytosis – Release of a large quantity of material from the cell when a vacuole or vesicle fuses with the plasma membrane. 1. Which of these vesicles is involved in osmoregulation? B is correct. Contractile vacuoles are especially important for osmoregulation of single celled animals in freshwater environments. They take up excess water from the cytoplasm and expel it periodically, thereby protecting the cell from osmotic stress. A gas vesicle is involved in optimizing photosynthesis and regulating buoyancy whereas the lysosome is primarily an organelle involved in intracellular digestion. Synaptic vesicles are found mostly in neurons and are involved in signal transmission from one nerve cell to another. 2. What is the role of the synaptic vesicle in transmitting signals along a neuron? D is correct. All of these are functions of synaptic vesicles. They contain proton pumps on their membrane that allow them to selectively concentrate neurotransmitters inside them, and are involved both in releasing neurotransmitters into the synaptic cleft and in their reuptake and recycling. 3. Which of these cells secrete material exclusively in response to an external stimulus? C is correct. Salivary glands are stimulated to secrete enzymes in response to the presence of food in the mouth. Chondrocytes and osteoblasts can secrete constitutively, without the need for an external stimulus.